NETWORK FINALS: BLUE BLOODS and THE EXORCIST lost 0.1 in final numbers, pushing the latter to a pitiful 0.3. CABLE HIGHLIGHTS: ESPN’s USC vs. Stanford COLLEGE FOOTBALL game topped Friday cable at 0.99. On Discovery, GOLD RUSH gained 0.03 to 0.82, and FINDING ESCOBAR’S MILLIONS was up 0.06 to 0.40. A&E’s LIVE PD slid 0.04 to 0.56. On a night that was big for all cable news not on Fox, MSNBC’s RACHEL MADDOW SHOW was the easy winner at 0.41/0.61/3.3M, but CNN’s LEAD WITH JAKE TAPPER was runner-up at 0.30/0.39/1.3M, with Fox News’s noon OUTNUMBERED at 0.26/0.37/2M. Nickelodeon’s LOUD HOUSE dropped 0.04 to 0.34 (simulcast on TeenNick at 0.03/143K and Nicktoons at 0.01/111K). On Disney Channel, the primetime ANDI MACK jumped a tenth to 0.30, and the morning PUPPY DOG PALS was at 0.27. On Bravo, DON’T BE TARDY returned from a week off down 0.07 to 0.28, and MARRIED TO MEDICINE was down 0.03 to 0.25. On Lifetime, BRING IT rose 0.08 to 0.27, and THE RAP GAME was down 0.03 to 0.24. 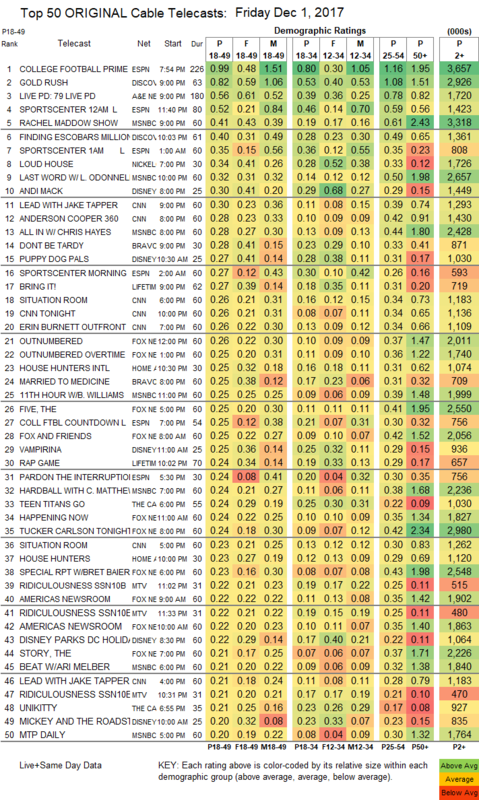 On HGTV, HOUSE HUNTERS INTL ticked up 0.02 to 0.25, and HOUSE HUNTERS was down 0.02 to 0.23. MTV aired 2 hours of RIDICULOUSNESS at 0.22/0.22/0.21/0.19. On ID, MARRIED WITH SECRETS premiered at 0.18, and DEADLY DENTISTS fell 0.09 to 0.16. 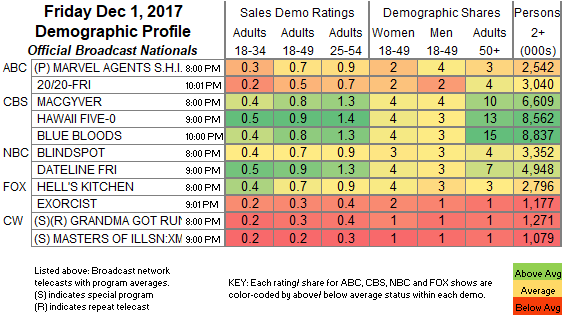 On Syfy, Z NATION sank by 0.03 to 0.15, and SUPERSTITION returned from a week off down 0.02 to 0.07. Spike’s BELLATOR was at 0.15. We’s MARRIAGE BOOT CAMP, also back from a week off, lost 0.03 to 0.13.